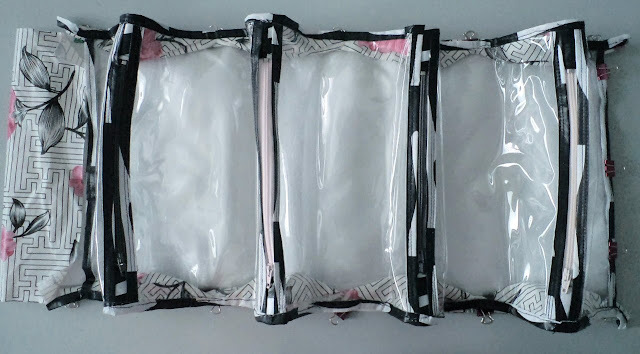 In January of 2015, I worked out a draft pattern for a roll up travel toiletry bag like the one you see pictured here. This was shortly after I had purchased my supply of waxcloth; my original plan was to make this out of that material. I'm not quite sure what exactly led to me shelve this project for over two and a half years. Perhaps at some point I realized that the waxcloth was not going to be sturdy enough to stand up to the punishment that an item like this would face. But then, I only really found out about the durability issue last year, so that can't be the whole reason. The end of my two and a half year long project! When I dug it out of my small "projects in progress" box a few months ago, I realized that it was almost finished. You may be able to make out that the design is based on four triangular zippered compartments attached to a backing, that all rolls up into a big rectangular box. In this configuration, it was completely made out of vinyl and waxcloth (with four regular zippers). Here is the bottom view of the "inspiration" organizer that I purchased back in the early 1990s. I paid $28, which wasn't an amount that I regularly spent on anything back then. But I convinced myself that it would serve me well for many years, which it has. While still functional, it's got visible rips and tears. Since I was now quite certain that I wasn't going to use waxcloth to make this, my first step was to take out the seam ripper and remove the binding around the outer edges (which would also remove the triangular side panels at the ends of the pockets). What I was going to use, was a lightweight cotton twill version of one of my Canadiana designs similar to the chiffon that I used to make my mini infinity scarf. The cotton twill has a durable, sturdy feel to it and doesn't need any stabilizer. The original bag is made out of fabric on the outside, but lined with vinyl for some measure of waterproof-ness and easy cleanup in case of spills. (And I suppose this was the original motivation for me to make this out of waxcloth.) The pocket panels themselves are clear vinyl. It has a carrying handle and closes with hook and loop tape. My prototype here is similarly constructed, with the exception that the pocket end pieces (i.e., the side panels) are just fabric. That being said, there may also be a practical reason for not adding more vinyl to the mix: that whole side panel is an absolute B-I-T-C-H to sew. I knew this from January of 2015 when I stitched on the original ones made out of waxcloth. So here I will offer a warning about this project. Although fairly easy to figure out and relatively fast to make (and doesn't require a lot of material), it features a step — that you have to do twice — that may drive you around the bend, cause you to punch out your sewing machine, or something much worse. Wrapping the binding around the side panels isn't that hard... sewing it is! I will say that my use of waxcloth on the zipper tabs probably didn't help my cause. They ended up being quite firm and trying to wrap binding around them as well as around the "wavy" side panels created a 3D sewing nightmare. Also, the bias binding that I used was extra wide, which wasn't ideal (but was what I had on hand). All lessons learned, but — and this is a very important "but" — even if you do use optimal materials in terms of size and type, this will still be a step that you'll likely hate with a passion. Not exactly my best work...! What I told myself as I was sewing up the side panels was just keep on going. Y'see, I'm sewing through vinyl and if I were to stop and yank out the stitches every time something went wrong — and then start over again and again and again and again — I would eventually just perforate it. So, my solution was just to barrel along and finish, warts and all. Speaking of perforating, take a look at this set of tracks that went awfully awry (this one I did have to stop and start again; I also decided to sew from the top instead of from underneath, which is not the normally recommended approach). This is what happens when you can't see where you're sewing! Upon reaching the end, I went back to the most egregious spots, pulled out the stitching and then just resewed in those spots. Certainly, it's not a technique I would normally employ, but for the sake of completing this and ensuring its ultimate usability, that was my best option. Even now, there are several small puckers that I'm not going to fix; it's not worth the suffering. 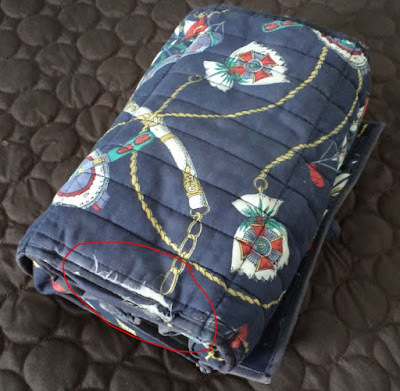 What's more, that binding is not particularly visible when the bag is rolled up. The exterior polka dot binding (which is just ribbon) has no issues. On the subject of issues, for some reason I did not trust my original cut piece of exterior waxcloth and reduced the length for the replacement fabric. 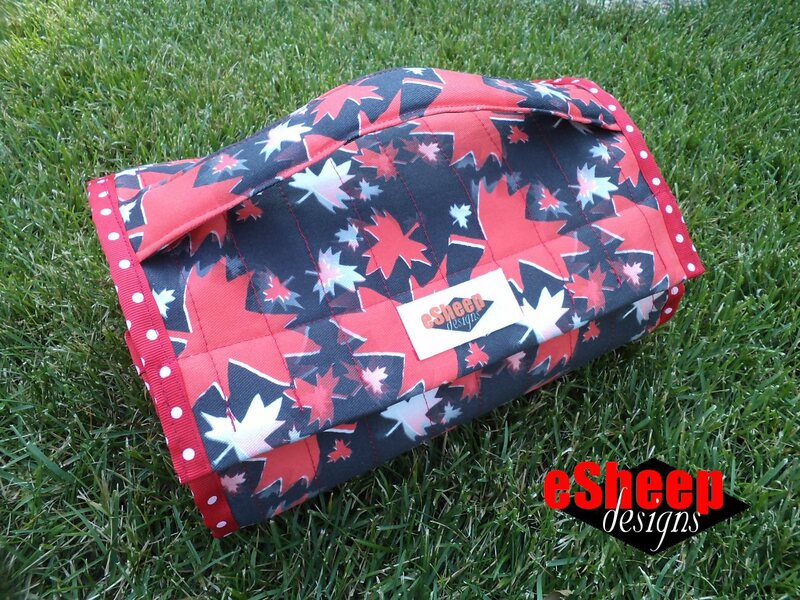 The shorter length affected the placement of the velcro and eliminated some planned exterior binding. The good news is that I retained the original waxcloth and recorded the measurements for future reference. If only I could move those pieces of Velcro up a bit...! And if only the zippers were just an inch longer...! Since writing up the main part of this post, I've now also taken this on vacation with me. It's passed the usability test. The most significant issue I had with it (apart from the placement of the velcro which I had already identified) were the zippers: they were a touch too short. I would definitely go with longer zippers next time. Filled to the brim and functioning fine! Have you done any sewing of bound fabric and vinyl around curves? Was it a pleasant experience?? Amazing job! I can't imagine working on a project like this travel bag. You have much more patience than I would have. Good for you Rochelle in finishing it! Yikes that sounded like too hard of a project for me to want to finish. 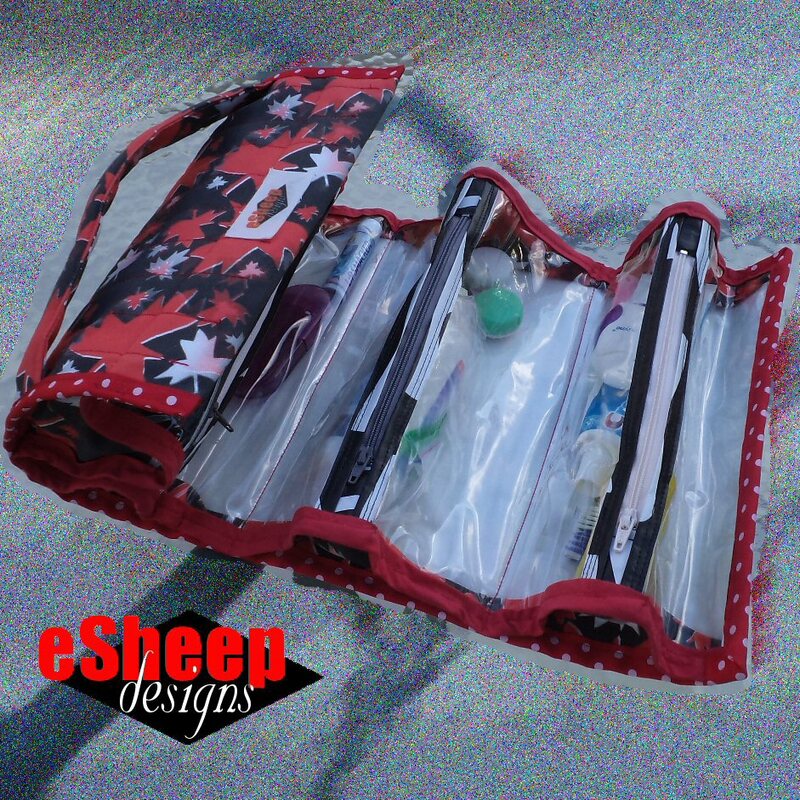 I have sewn a small bit of clear vinyl for an ID pocket and made a see-through project bag with a zipper with curved edges that lies flat. Those weren't bad to sew, but anything 3-D, forget it! I will stick with 100% cotton fabrics, which I have in abundance!!! I would love to see a template for this-and would throw myself under the bus and volunteer to be a pattern tester for you if you were thinking about writing one. LOL... good on you for laying your life on the line like that! I would be happy to keep you in mind on a list, but right now, I have no way to contact you since you are a "noreply-comment" person right now. Maybe send me a message via the contact widget on my sidebar at left?